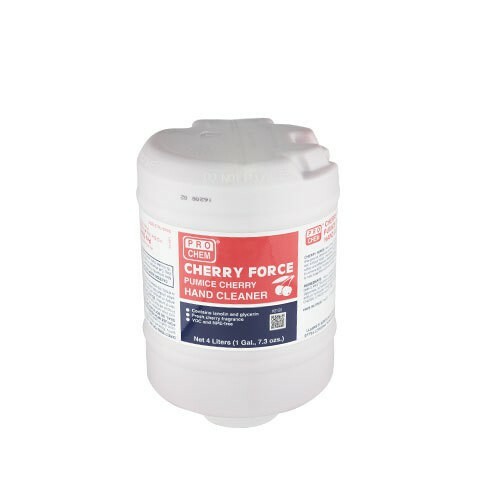 Cherry Force | Pro Chem, Inc.
CHERRY FORCE is a premium, heavy-duty, lotion hand cleaner effective for removing the toughest soils. Fine-ground, American pumice works with the formula to provide fast and complete removal of grease, most inks, tar, asphalt, oils, lubricants, paints, industrial carbon and more. This advanced conditioning formula contains ten skin care ingredients including almond oil, soy oil, glycerin, aloe vera, jojoba, lanolin, wheat germ extract and vitamins A, C and E. It is compliant with all state VOC regulations. In addition to the 4000 mL System 2000 container size, this product is also available in a convenient 15 ounce bottle. Apply a small portion to hands and rub gently. Rinse with water and dry. 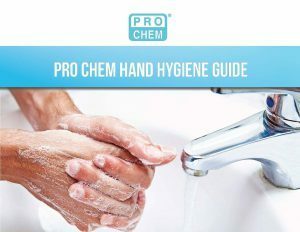 If no water is available, wipe with clean cloth or paper towel.